(a) Counseling of NRI candidates for MD/MS/Diploma will be held on 4April’18. (c )6 months fee from the selected candidates will be collected at the venue of counseling in the form of Demand Draft favoring Registrar, BFUHS payable at Faridkot. There is no other means of fee payment. (d) The candidates who are already been admitted in any college through All India Counseling should carry original certificates/NOC from the respective college. They will have to surrender the seat on spot from the respective college. Important: According to the instructions of MCC, the joining of the candidates who will be allotted a seat in the counseling is compulsory. The candidates who fail to join the respective allotted college in the first round of counseling shall not be eligible for subsequent counselings. 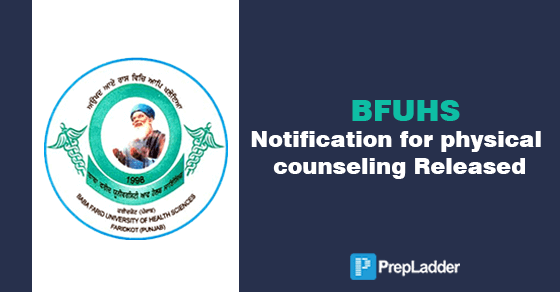 The candidates who will not opt/forgo the seats in first counseling or have not attended the 1st counseling but are registered with the BFUHS, shall still be eligible for subsequent counseling of State of Punjab. The candidates are advised to get the idea of their merit/quota/college and prepare the draft accordingly. It is highly recommended to prepare 2 DD’s thus amounting to Rs. 262500/- and Rs. 62500/-. Both the DD can be utilized towards payment of fee of Private College/ Govt. College as the case may be.